The following articles, written by IA editor David Donovan, were published in Armlet in 2007. The lavish and seldom acknowledged costs of royalty to Australian taxpayers is always pertinent when it comes to considering the arguments for a republic. HOWEVER, more troubling for all Australians is news revealed from a phone call by IA editor, David Donovan, to Jim Frecklington today (7 July 2010) that has shown that despite the Australian taxpayer funding the construction and transportation costs of the so-called Royal Coach Britannia as an 80th birthday gift for the Queen, it still sits on display in Manly attracting paying guests for Mr Frecklington, who offered Donovan a visit on Saturday. A royal rort? You decide. The Australian Government paid $1.8M for the Royal visit for the Commonwealth Games in Melbourne and $250,000 to for a royal coach glorifying Britain, but not Australia. A blow-out in the cost of the Royal Visit led to a departmental budgetary shortfall of $1.4M, Prime Minister and Cabinet Department Assistant Secretary, Frank Leverett, told the Senate Estimates Committee. "Royal visits are always a high expenditure item," said Mr Leverett. The Government also paid $250,000 in 2006 to a Sydney man to help him build a carriage said to be an 80th birthday gift for Queen Elizabeth II. The Queen was 80 on June 3, 2006, but the carriage is still in Sydney. 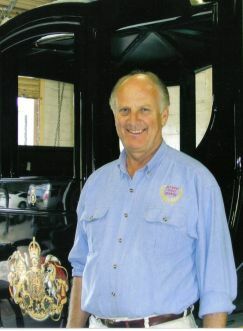 The builder, avowed monarchist Jim Frecklington, constructed a similar coach for the 1988 Bicentennial, which the Government also funded. This time, funding was obtained after he sent a letter to the Prime Minister in March 2006. The Government refused to release this letter. Questions were also raised about due diligence in relation to the disbursement of funds: no-one from the Government has met with Mr Frecklington, sighted the coach nor confirmed if the coach had other sponsors. “So, if I had sent you a letter saying that I was making a coach for Her Majesty the Queen, I could have scored $250,000 too. I jest, but surely there is some due diligence on this?” enquired Senator John Faulkner at the Estimates hearings. “I believe so, yes,” replied Mr Leverett. Leverett: “There was a very detailed glossy brochure produced by Mr Frecklington”. The ARM will continue to research the true cost to the Australian taxpayer of subsidizing the British Royal Family – universally acknowledged as being amongst the world’s richest people – to show that a republic would result in significant recurrent cost savings for Australian taxpayers. 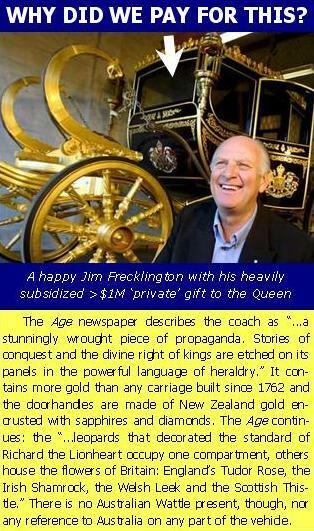 The Federal Government has increased the payment to Jim Frecklington [see Armlet, Summer 2007], the royal coach builder, from $300,000 to $350,000 to transport ‘The Royal Coach Britannia’ from Sydney to London. The coach is an 80th birthday present for the Queen. She turned 80 on April 27, 2006. The builder is still not sure when it will be finished. “There are still some more things I would like to add to it before I am satisfied with it,” he told Armlet. Mr Frecklington said he had just returned from England where he had managed to procure from the Queen a sliver of the crowning stone of the Kings of Scotland: the ancient Stone of Scone. Presumably, he will fashion this into some part of the carriage, and then eventually return it to the donor. No one from the Government has inspected the coach nor determined when or, indeed, if it will be finished. In fact, the Government has placed no conditions at all on the grant, leading to a heated May Senate Estimates Hearing upon this issue. In his Armlet interview, Mr Frecklington appeared to imply that full Federal sponsorship of the project may be given. He said this after being asked why taxpayers should pay for the coach, to which he also indicated that the coach was a gift to Britain, not simply the Queen. Mr. Frecklington: “There is plenty of precedent for a gift from one country to another: an example is the French people to the US with the Statue of Liberty”.